Are you looking to take a Royal Caribbean cruise in 2019 without breaking your budget? This post is aimed at helping you figure out ways to budget for the vacation to save money! To help you get the most out of your vacation dollars, we’re here with 10 money-saving tips for your next Royal Caribbean cruise. Regardless of your budget, it is never a bad idea to consider ways to save more money. Some may find cutting spending onboard is the only way to make a Royal Caribbean cruise financially viable, while others may find cost savings a means of affording more to do onboard (or a second cruise). 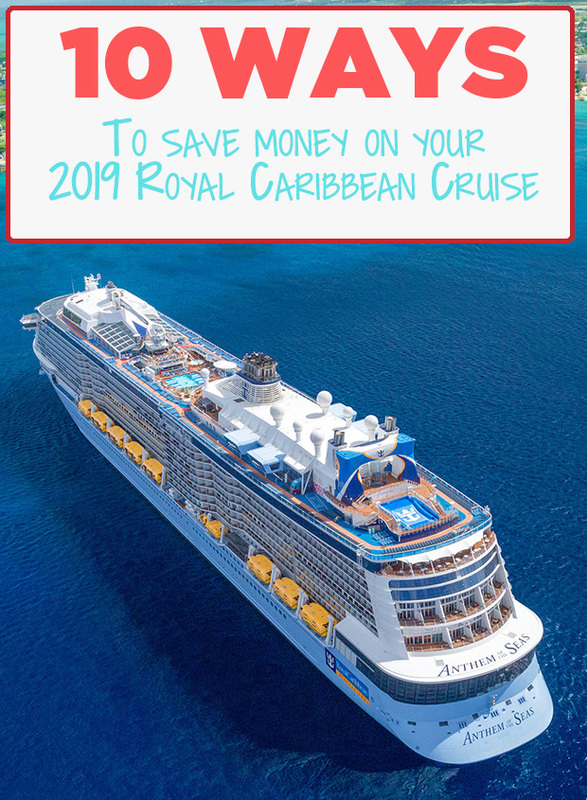 Here are some of our recommendations for saving money on your 2019 Royal Caribbean cruise vacation. Not all of these strategies may be for everyone, but the hope is at least one (if not more) will result in more money in your pocket and that generally makes everyone happier. Did you know that Royal Caribbean allows its guests to bring a limited quanity of wine or non-alcoholic beverages on their cruise? Guests may bring up to two bottles of wine per stateroom on embarkation day. Each bottle of wine may be up to 750ml in size. Do not put the wine in the luggage you hand over to the porters on embarkation day. Wine lovers will be able to bring a couple of bottles of their favorite wine on their cruise at a savings compared to purchasing the wine onboard. Moreover, bringing your own wine means you will save money on your total bar tab during your cruise. My favorite aspect of bringing your own wine is if you do not finish the bottle of wine, Royal Caribbean can store the wine for you and deliver it another restaurant at that time. It is important to be aware that Royal Caribbean will charge you a corkage fee for personal wines opened at any restaurant or lounge onboard. Even with the corkage fee, you will still save a significant amount of money compared to purchasing a bottle of wine onboard. Guests are prohibited from bringing alcoholic beverages onboard any cruise ship, with the exception of being able to bring two bottles of wine per stateroom. Yes, you can now bring small quantities of non-alcoholic beverages in a carry-on or hand luggage onboard only on boarding day. Specifically, non-alcoholic beverages brought onboard may not exceed 12 standard (17 oz) cans, bottles or cartons per stateroom. Distilled water or specialized beverages such as, milk for medical purposes, dietary or infant use, are permitted. Specialty restaurants are an optional way to gastronomically indulge while on your Royal Caribbean cruise, and these days, it seems like specialty dining has never been more popular. If you have your heart set on trying out places like Sabor, Izumi or Chops Grille, you should consider buying a dining package to save money overall. Royal Caribbean offers on most, if not all, of its cruise ships specialty dining packages, where guests can dine at 2, 3, 4, or 5 specialty restaurants during their cruise for one low cost. The advantage is these packages cost less than trying to book the same restaurants individually. Of course, you could forgo specialty dining completely and really save some money, but there is no reason to not save some cash when checking out these favorites. Your best bet is to purchase the dining packages on Royal Caribbean's Cruise Planner and to read the terms and conditions of how they function. There is no question these packages will save you money on specialty dining, provided you were planning on eating out while onboard in the first place. In our experience, Royal Caribbean's drink prices are about what we pay for drinks at many restaurants on land, but there is no question you will save money by drinking at the ports of call you visit compared to onboard. Bars and restaurants at the ports your Royal Caribbean ship will visit regularly offer cheaper drink prices for beers and cocktails and that can mean big savings if you can wait to enjoy some drinks when on land, compared to on your ship. Depending on your itinerary, this strategy may be more lucrative than others, but it is a good way to indulge in your favorite mixed drink or cerveza for a lower cost. If you are going to enjoy a few cocktails onboard your Royal Caribbean ship, you can avoid paying top dollar for them. When looking at Royal Caribbean drink prices, many guests base their math of whether a drink package makes sense off the regular price for drinks, but in reality, there are drink specials all around the ship that bring that price down. One of the best ways to get a deal on a cocktail is to order the drink of the day. The drink of the day is a select cocktail that changes every day, which has about a 20% discount on it and is available from most bars onboard. You can just ask the bartender or waiter what the drink of the day is and take advantage of those savings. In addition, individual ships will run their own bar specials, like 2 for 1 deals, drink combo deals and other happy hour discounts. The exact details of a drink special will vary from ship to ship, and sailing to sailing, but it is important to understand that they exist. To find drink specials, consult the Cruise Compass for some advertised deals, as well as walk around bars and look for posted signs. Personal fiscal responsibility aside, proper use of a credit card can definitely save you some money on a Royal Caribbean cruise. Royal Caribbean has its own branded Visa credit card, which allows guests to earn points that can be redeemed for onboard credit on future cruises (as well as other rewards too). For each purchase made with the credit card, you can earn points that can be redeemed for onboard credit or even free cruises. Of course, there are lots of other credit cards out there with various reward programs that can help offset the cost of your cruise. Credit card reward programs with cash back bonus are popular options. Regardless of which card you use, if you can manage to pay off each month's balance on time, you ought to be rake in the credit card rewards quickly, which can go towards paying for the cruise, or the various costs associated with the cruise (new clothes, airfare, hotels, etc). At each port of call you visit, Royal Caribbean will offer plenty of shore excursions to consider, however you might look past those excursions to save more money. While Royal Caribbean's shore excursions offer convenience and reliability, they tend to cost more and (arguably more importantly) involve larger groups that move at a slower pace. Instead, consider booking shore excursions on your own. This will likely save you money, or at the very least offer you more variety in options available as well as customization in what you see and do. In many ports, you can skip booking an excursion all together and simply walk off the ship and start exploring the port. Taking a taxi into town, walking the streets and discovering things around you are at the core of what makes port days so much fun. If you are looking to book a shore excursion on your own, we recommend planning it out before your cruise. This will give you time to consider all options, research the tour operator, and find the best prices. Royal Caribbean's Vitality Spa is the perfect place to relax, enjoy a treatment that is customized for you and feel rejuvenated. While the spa is a magical place for those looking to relax, it can also be expensive. The key to saving money on the spa is to wait for port days to book a treatment. The spa is open everyday of your cruise, but on days your cruise ship is docked in a port, they will often run much better deals to convince guests to stay onboard and indulge in a treatment. The Vitality Spa is a business, and when the ship is in port, most guests are off the ship exploring, which means the spa is not nearly as busy. As a result, they will run different specials that are more lucrative than normal to get folks to book something and stay onboard. You can inquire about port day specials at any point in your cruise at the Vitality Spa desk and see if it looks like a good deal to you. Often, the port day spa specials are the best overall values found in the spa. This tip has more to do with not incurring a large bill when you get home. These days, a smartphone is as essential to bring on a cruise as sunglasses or your passport, but if you do not prepare your device properly, it could cost you a lot of money. Before your ship is ready to sail away, be sure to put it into airplane mode, which disables your phone's ability to use a cellular signal. The reason you want to do this is once your cruise ship leaves your home country, your phone will look for a signal outside the regular cellular network and connect to the ship's cell tower, which is known as roaming. Roaming means you are out of network, and will result in high fees for pretty much anything you do that uses the cellular signal. You should place the phone into airplane mode, and then be confident in using your phone for taking photos, playing games or even connecting to the ship's WiFi without fear of a monster bill later that month. Imagine this: you are on the pool deck, enjoying another beautiful at sea and suddenly you see a drink station set up with the cutest glowing/flashing/colorful glasses. They are cool looking and the drink inside looks even better, but you are better off asking for that tasty cocktail sans souvenir cup. The souvenir cups are nice, but it tacks on a few extra dollars to the cost. You can ask for the same drink without the souvenir glass/mug/pineapple and save on the cost of the drink. This saves you money, but you still get to enjoy drinks by the pool. The best way to ensure you are getting the lowest price on your Royal Caribbean vacation is to use a travel agent. Regardless of if this is your first or fiftieth cruise, a travel agent is a worthwhile "investment," and the best part is they are free to use! Travel agents provide great service to folks looking to take a Royal Caribbean cruise because they are keyed in on the latest promotions and they can be your best advocate for finding promotions that help you, not just the day you book but every day until final payment. A good travel agent will be able to assist with the booking process, and give you every single permutation of pricing to figure out which itinerary, stateroom or promotion makes the most sense for you. I cannot count the time I have saved by having the travel agent jump through the proverbial hoops for me to figure out what is the best deal for my family. The reality is you only stand to benefit from using a good travel agent, both in convenience and time saved. Do you have any of your own money-saving strategies when on a Royal Caribbean cruise, or perhaps saving for a Royal Caribbean vacation? Disagree with any of our tips? Share your thoughts in the comments! A Royal Caribbean cruise is a top choice for many families that want to enjoy a great vacation, but there are some important strategies for saving (a lot of) money off the total cost of the cruise. Bargain hunters should be aware there are some definite ways to bring that total cruise cost down. Here are five ways we have found to consistently save hundreds of dollars on cruise vacations. If there is one tried-and-true strategy for getting the lowest price on a Royal Caribbean cruise, it is to book the sailing as early as possible. If you can book your sailing 12, 18 or even 24 months in advance, you will very likely pay much less than someone that waits to book their sailing just a few months before the cruise. The simple reason why booking early gets you the lowest price is that when a sailing is put on sale, all the staterooms are available to book, and thus, demand is at its lowest. As guests start to book rooms, supply goes down, which inversely drives prices up. Over time, we typically see prices for a sailing go up. Moreover, if you live in a country that allows re-booking prior to final payment date (United States, Canada, Australia, etc), you can always take advantage of price drops, if they were to occur, and get the new lowest price. If you book early enough, you may find regardless of the deal or promotion Royal Caribbean publicizes, the rate you had booked early on is still a better deal. If you can manage to go on a cruise without having to fly, or take another expensive means of transportation, you will reap a ton of savings. 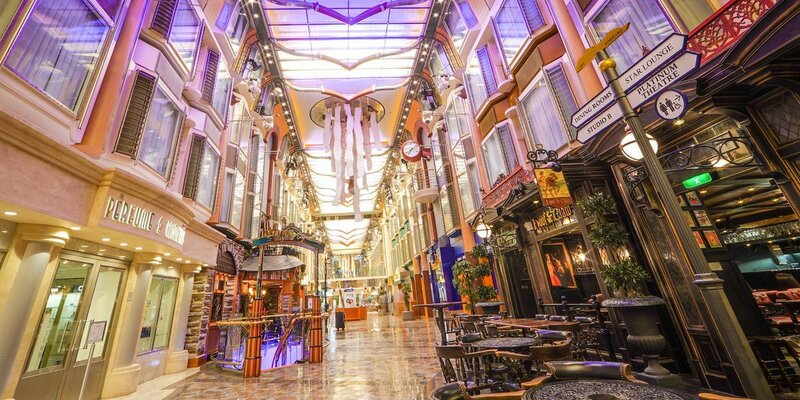 In addition to the traditional cruise homeports in Florida, Royal Caribbean also offers year-round and seasonal cruises from New York, Baltimore, New Orleans, Galveston and San Juan. This means a great deal of convenient embarkation ports that can be driveable. By not having to include an airline ticket in your vacation budget, you will save hundreds, if not thousands, of dollars. Of course, there still will be a transportation cost to get to the port, but very likely the savings in not buying an airline ticket will outweigh gas, tolls and even a hotel stay. If you are the sort of person that will indulge in specialty dining or alcoholic beverages onboard your Royal Caribbean cruise, a dining or drink package can save you a lot of money. Royal Caribbean's dining packages allow guests to enjoy meals at a variety of specialty restaurants for one low price. There are many packages available, but taking advantage of these dining packages will save money compared to eating at those same restaurants, but paying the walk-up price without a package. When you figure multiple people investing in a dining package, the savings stack up quickly. Likewise, a Royal Caribbean drink package can save you money, provided you drink enough every day of your cruise to make it worthwhile. Guests pay a flat cost to enjoy unlimited beverages that are included in the package they select. Be sure to get a discount on a Royal Caribbean drink package prior to your cruise to increase your total savings. It is worth noting that a drink or dining package may not inherently save everyone money. The cost savings depend on how much you will actually consume on a cruise. It is important to sit down before your cruise and think about how many drinks you might have, factor in time off the ship in foreign ports of call, and determine if a drink package is right for you. Dining packages are a bit easier to figure out if they are a worthwhile investment, because you can look at your Cruise Planner and determine what looks of interest and plan accordingly. Royal Caribbean will reward you if you book another Royal Caribbean cruise, while still onboard your current sailing. These rewards come in the form of onboard credit, which can stack up into the hundreds of dollars quite quickly. Dubbed NextCruise, Royal Caribbean has changed up some of the rules lately for how the program works, especially if deposits are refundable or not. It is important to be aware of all the rules on canceling or changing sailings prior to booking. However, if you are certain of the sailing you want to take, booking onboard will garner significant savings, especially on longer sailings (7 nights or more) and/or balcony and suite staterooms. The NextCruise program is one of the easiest ways to earn money towards your next sailing. If the dates you can take a Royal Caribbean cruise are somewhat open, you can shave off hundreds of dollars from your cruise fare. Just like the entire travel industry, cruises have peak and off-peak seasons. Booking a cruise over Christmas week will see a much higher cost than if you opt for that same cruise two weeks earlier or later. Those that can cruise when many families are stuck following a school or work holiday calendar, will find rock bottom prices for cruise fares. Finding the lowest fares typically has more to do with when you are actually going on your cruise. In general, you will find lower fares if you are willing to cruise during the "shoulder seasons" and/or when school is usually in session. Picking Royal Caribbean cruises that sail during these times of year often net the lowest fares because it is when less people have the opportunity or inclination to cruise. Perhaps the most common question we get on Royal Caribbean Blog is how someone can save money on a Royal Caribbean cruise or just get a good deal on their sailing. It certainly makes sense to get questions like this, because no one wants to overpay for their cruise and we would all prefer to spend the least possible for our cruise so we have more money to spend on things like shore excursions, souvenirs, drink packages and more. While there is no silver bullet solution that will work for everyone, there are some good guidelines we can share to getting you the best possible pricing. We will start things off with our best tip, and that is to book your Royal Caribbean cruise is far in advance as you can to get the lowest possible fares. In general, Royal Caribbean rewards those that book their cruises early with the lowest fares. As more people book a given sailing, prices tend to rise because there is less inventory available. Royal Caribbean typically publishes its cruise schedules up to two years in advance, which sounds like a lot of time to wait for a cruise, but it is among the best ways to lock in the best prices. Your best bet is to book early and place a deposit on a sailing that can lock in that price until your final payment date. This not only gives you the lowest possible price, it also gives you the most time to make payments on the cruise. Plus, that deposit is fully refundable if you happen to change your mind later. If you cannot book two years in advance, that is okay too. They key is not to wait, but instead book a cruise as early as you can. Whether you are brand new to Royal Caribbean or a veteran, you really ought to book your cruise with a good travel agent. Travel agents are paid by Royal Caribbean and cost you nothing to use. What they offer to the customer is quality service and expert advice on Royal Caribbean bookings. It is their job to stay on top of the various deals and promotions Royal Caribbean rolls out there and because they are constantly pricing a variety of sailings across Royal Caribbean's fleet, they may be aware of deals and savings out there that you might not have considered. In addition, even after you book a cruise, Royal Caribbean is constantly rolling out new promotions that could save you even more money, and a good travel agent will be there to re-price things for you without your intervention. On a personal note, I book all of my Royal Caribbean cruises through a travel agent for the service they provide. I figure, let them sit on hold with Royal Caribbean while I do something much more fun! The first two tips I shared will get you some great prices, but if you want to find those super low cruise fares, then you ought to consider taking a Royal Caribbean cruise when many others are not willing to. Royal Caribbean offers cruises throughout the year, but there are certainly times of the year when cruising is more in-demand than other times. Since Royal Caribbean is a family cruise line, what you want to do is avoid taking cruises when kids are off from school for holidays. Summer, Christmas, Spring Break and Easter are all times when families have built in vacation time and many look to cruise. If you can, consider taking a Royal Caribbean cruise when most schools are in session because these are the times of year when you will be able to net some super savings. That is a $849 difference in price between two identical sailings separated by a few weeks! In addition to considering time of year, also consider the ports Royal Caribbean sails from and which ones can get you a better deal. 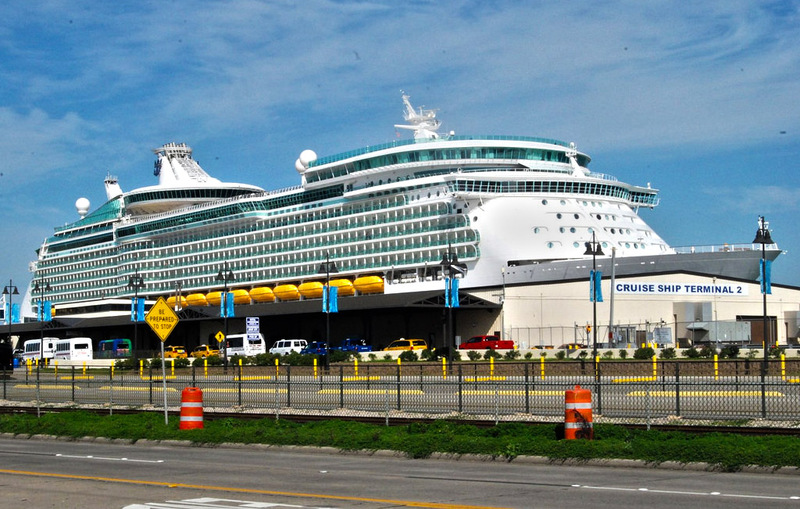 Royal Caribbean offers cruises from a variety of ports around the world, but some sailings always seem to be priced lower than other sailings mainly due to where the cruise departs from. The reason prices are lower from certain ports is because they are more difficult for out of state guests to travel to, and thus, there is less demand for these sailings. In North America, you can often find great rates from these cruise ports. If you are willing to fly a little further and/or drive a bit more, Royal Caribbean cruises from these ports tend to offer some fantastic deals consistently throughout the year. When you watch any of Royal Caribbean's television commercials, you will see scenes from their Quantum and Oasis class ships and they are absolutely amazing experiences, but they also come with premium pricing. Royal Caribbean has a fleet of 23 cruise ships and they all offer really fun experiences. The thing is, Royal Caribbean charges a premium for its newest ships, so some of the best deals can be found with the (relatively speaking) older classes of ships. I know it sounds like with an older ship they will not have all the whizz-bang features of the new ships, but Royal Caribbean has spent millions of dollars in upgrading these ships and I would not hesitate to cruise on them. There are plenty of others as well, but the bottom line is if you can look past the latest and greatest, you can find great deals on some truly amazing ships. What are your best tips for Royal Caribbean cruise deals? Tell us in the comments!